For the tofu: Drain the liquid from the package of the tofu. Pat the tofu dry with a paper towel. Cut the piece of tofu into ½-inch slices. Heat the canola oil in a large stock pot and pan-fry the slices until slightly golden. Don't overcook the pieces or they'll start to get hard. The tofu should still be moist. Transfer all the tofu to a paper towel , leaving as much oil as possible in the pot and let it cool. Once the tofu slices are cool enough to handle, cut them into large cubes. Set aside on a plate. Prepping the spicy paste: In a mortar and pestle, grind the sesame seeds into a paste. Add the miso, red Thai chiles, 1 kaffir lime leaf, garlic and Thai basil. Coarsely grind the mixture. In the same stockpot, heat the canola oil again. Add the spicy paste and stir for 3-4 minutes until fragrant. Transfer to a small bowl, leaving about 2 teaspoons in the pot. Preparing the vegetables: In the same stockpot, add more oil if necesary (I didn't), half the amount of galangal, the celery, mushrooms and corn. Stir fry for 2-3 minutes. Transfer to a plate. Set aside. In the same stockpot, add the remaining kaffir lime leaves and galangal. Cook for 2 minutes, then cover with the vegetable broth. Bring to a boil. Cook for 20 minutes. Strain through a sieve. Discard the solids. Pour the broth back into the pot. Check the sourness of the broth. Add the lemon juice. Taste and adjust seasoning. Add the reserved spicy paste and fried onions. Taste again. Finish with palm sugar and salt (if necessary). The secret is to balance the sweetness and the saltiness. Be sure not to over-salt! Add the coconut milk. Bring to a near-boil, then add the bok choy. Cook for about 5 minutes. 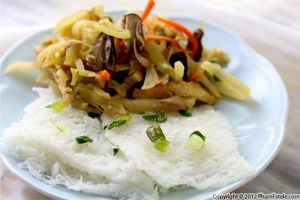 Finish with the mushrooms, celery and corn mixture, the pan-fried tofu and 1 tablespoon green onions. Set aside. Fill a medium-sized saucepan with water. Bring to a boil. Add the udon noodles. 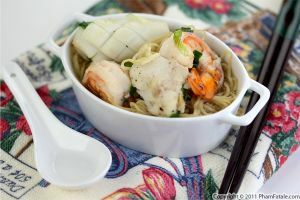 Using chopsticks, gently separate the noodles and cook for 2-3 minutes. Drain and set aside. Drizzle with sesame oil. When you're ready to serve, bring the soup back to a boil, then add the reserved vegetables. Add cilantro and the rest of the green onions. Cover and let simmer for 5 minutes. 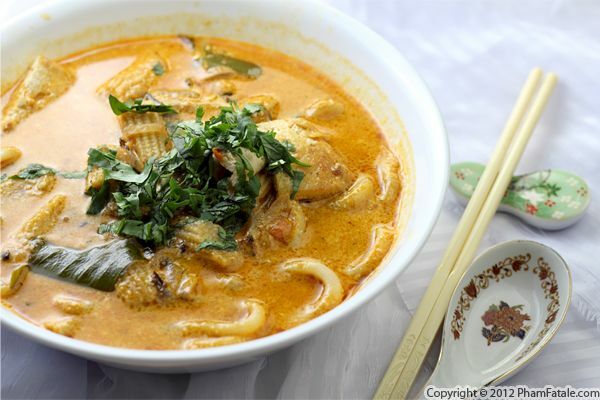 Place the cooked udon noodles in each serving bowl and complete with the spicy coconut soup. Garnish with more Thai basil and cilantro. The broth should be made in 3 steps in this order: sour, salt and sweet. 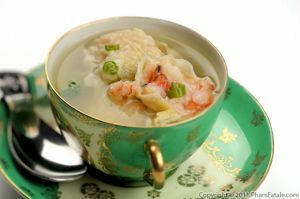 Once the sugar is added, it's difficult to go back and modify the flavor of the broth, so it's not too sweet. The kaffir lime leaves are from our garden. They're so fragrant and very useful in Asian cuisine. If you have the space to plant a kaffir lime tree and you're into Asian cooking, go for it; it's a good investment. Plus the plant doesn't take too much space either. I buy Sukina brand udon noodles from a local Korean specialty market. They're called "Oriental style noodles" and they're sold in (3 x 200-gram) individual packages. 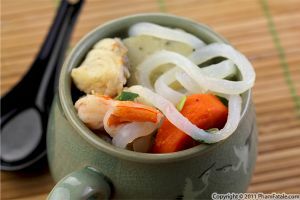 You could also use fresh bánh canh noodles (Vietnamese noodles). 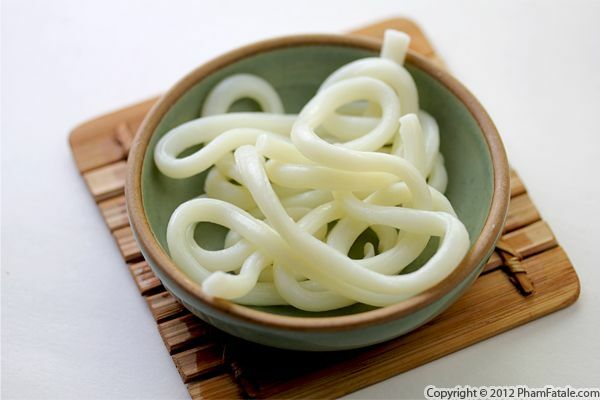 However, they have a chewier texture and look almost translucent whereas udon noodles look more opaque. The addition of fried onions gives a nice aroma to the broth. All the ingredients listed above can be found in most Asian stores. Published By: Jacqueline Pham on September 16, 2012.